Hardly a site of the energy or steel industry can be found, where no machines of the AUMUND Group are in use for the handling of coal or other bulk materials. They provide not only for a timely and efficient transport. AUMUND machines are also perfectly suited to bring the use of coal in power generation and steel production into alignment with environmental protection rules by unloading trains, ships and trucks almost dust-free. Coal is delivered in large volumes by ship or rail and stockpiled in power stations in tips, bunkers or large-capacity silos. A wide range of AUMUND equipment is employed for stockpiling and transport within the yard. The situation on site is decisive for the selection of the machine. The SAMSON Eco Hopper is the prime selection for unloading ships. Besides receiving the material, it is crucial for environmentally friendly dust control during the unloading process. The unloading of rail- borne wagons is by SCHADE wagon tippler (see picture above). Its high unloading capacity is adaptable to the conditions on site. With a rotary, crescent or side tipping layout, these tipplers can empty up to 25 rail wagons per hour. In many cases, coal stockyards feature blending bed technology to be able to homogenize the raw material before being inserted into the production process. The necessary technology is provided by SCHADE Lagertechnik in form of bridge-type reclaimers, portal and semi-portal reclaimers and other high-performance machines. With coal stored in bunkers, AUMUND discharge conveyors or SCHADE wagon unloading systems are ready to move the material around at high capacity after discharge. For feeding of the bunker, inclined conveyors (such as deep drawn pan conveyors or bucket apron conveyors) as well as AUMUND bucket elevators can be employed. AUMUND weight feeders ensure precisely dosed mill feeding. Towards the end of the production process, AUMUND Fo¨rdertechnik machines are used in ash removal and in handling gypsum generated during the desulphurization process. Coal, gypsum and ash are lifted and vertically transported by bucket elevators in coal-burning power plants. Horizontal transport is by conveyor systems. Also discharge devices are provided by AUMUND Fo¨rdertechnik. Besides the above-mentioned wagon unloading systems, CENTREX® devices or AUMUND conveyor systems are standard equipment for power stations. Another major industry depending on coal is the steel industry. Similar to power plants, coal has to be received, stored, homogenized and inserted into the production process in steel mills. Among worldwide orders, two semi-portal scrapers have recently been delivered by SCHADE Lagertechnik GmbH to Baosteel in China. In September 2015, the two machines will be assembled at the Shanghai Baosteel Group Corporation, the second-largest Chinese iron and steel conglomerate. Due to new emission control regulations in China, Baosteel is obliged to canopy all stockpiles. For the storage yard, SCHADE sold two semi-portal scrapers with a reclaiming performance of 1,500tph maximum and a rail track of 31.5 metres. “Almost all steel mills in Asia look to Baosteel, since Baosteel is considered to be one of the best steel providers and the trendsetter for new technologies. Therefore this order was strategically very important for our business in Asia,” explains Andreas Markiewicz, SCHADE Sales Director for Asia. Meanwhile, SCHADE has more than a dozen references from the Chinese steel industry and is gaining an increasingly large share of the market there. The exterior roller chain, a specialized design and an especially energy saving layout, as well as the environmental protection factor, have been significant arguments during competition with local providers. However, machines for moving bulk material are not only used to handle coal or lignite. In the same industry, solutions from the AUMUND Group are used for other materials, such as iron ore for example. In October 2012, SCHADE received an order from Jiangyin City DADI Machine Make Co. Ltd. to deliver six semi- portal scrapers for iron ore to the state-owned Inner Mongolia BaoTou Steel Union in Baotou City, Mongolia. The company is a subsidiary of the Baotou Iron & Steel Group, the largest industrial enterprise of Inner Mongolia. The order volume for SCHADE Lagertechnik covered six semi-portal scrapers (rail track: 31.5 metres) with an extraction performance of 1,650tph each. The start of operation was in 2013. At the end of 2014, SAMSON Materials Handling was also able to register orders by Baosteel to deliver two of the largest boom feeders ever. The SAMSON mobile boom feeders are designed for continuous operations during the maintenance period and occasional usage for stockpiling. The boom feeders have a capacity of 1,200tph (tonnes per hour) for iron ore and 500tph for coals each. Weighing at around 80 tonnes, the boom feeders are mounted on oversize tracks to spread the load and remain within the client’s ground pressure limitations. These units will create a stockpile height of 8 metres, fitted with 15-metre radial boom. The design can be expected to extend to a 30-metre boom with stacking height to 15 metres or even beyond. In April/May 2015 the testing phase is running successfully. Engineers of the AUMUND Group develop state- of-the-art machines for handling bulk material. However, they are also experts in conversions and retrofits of machines built by both AUMUND companies, competitors or suppliers that are no longer in the market. The prime aim of these projects is to increase the capacity or to improve the reliability of the machine at reasonable capital cost. Conversions are based on a thorough analysis of the existing situation. Improvement is usually achieved by replacing major equipment components and lifting the performance level of the installations to AUMUND standards. The expertise necessary to solve these challenges has been gained from a multi-year experience with more than 1,000 conversion and retrofit projects in the last ten years. AUMUND Group today being renowned in many areas of conveying and storage technology. The manufacturing companies AUMUND Fo¨rdertechnik GmbH (Rheinberg, Germany), SCHADE Lagertechnik GmbH (Gelsenkirchen, Germany), as well as SAMSON Materials Handling Ltd. (Ely, England) are consolidated under the umbrella of the AUMUND Group. In conjunction with the headquarters of the manufacturing companies, the global conveying and storage technology business is spearheaded through a total of eight locations in Asia, Europe, North and South America, and a worldwide network of agents. The fully enclosed, screw-type unloader will be used to discharge coal from vessels of up to 92,500dwt at a rated capacity of 1,500tph (tonnes per hour). This is Siwertell’s third recent contract for Philippine coal- fired power plants says Ola Jeppsson, Sales Manager, Siwertell. “It follows unloader contracts for the Pagbilao and Therma South power plants. In all cases the customers needed a high-efficiency, environment-friendly unloader. They chose Siwertell because we are the world’s leading supplier of unloaders meeting these important requirements. The unloader will be constructed at Siwertell’s sub-contractor’s premises in Nantong, China. Delivery of the fully constructed machine by heavy lift vessel is anticipated for mid December 2016. Final commissioning and performance tests will then be carried out at the power plant. Siwertell coal unloaders offer an ideal solution for power plants and other industrial applications that need a dependable, high capacity, efficient and clean fuel supply. In addition to high rated capacities, they deliver high through-the-ship capacities by virtue of their continuous operation. Their low weight minimizes loads on the jetty, saving money in civil engineering works. Siwertell ship-unloaders and loaders are based on unique screw conveyor technology, in combination with belt conveyors and aeroslides, and can handle virtually any dry bulk cargo, such as alumina, biomass, cement, coal, fertilizers, grain and sulphur. Siwertell’s product portfolio includes ship-unloaders, mobile ship- unloaders, shiploaders, conveying systems and complete bulk terminal solutions, all of which are designed to ensure environmentally-friendly and efficient cargo operations. Martin Engineering has redesigned an integral conveyor transfer point component to eliminate worker entry into the chute box for safer replacement, easier maintenance and reduced downtime. This system can be used with a variety of commodities, including coal. Conventional wear liners have historically been installed inside the chute, but the EVO® External Wear Liner from Martin Engineering is placed on the outside, improving skirtboard sealing and preventing spillage. The result is excellent performance with fewer labour hours and a lower cost of ownership. Previous designs securely welded the wear liner to the inside of the chute, with only the skirt seal located on the outside. The logic behind the conventional design is for the wear liner to protect the skirtboard, which is typically 1⁄4-inch sheet metal and not strong enough to withstand the sustained force and abrasion from bulk material. After elevating the chute box above the material flow, a 3/8” or 1/2” (0.95 cm or 1.27 cm) thick abrasion-resistant liner plate (AR 400 or 500) is mounted on the outside of the chute, followed by the skirt seal. Mounting brackets with jackscrews provide a tight hold, with precision adjustment of the wear liner to reduce spillage. This system closes the gap between the liner and the sealer, thus eliminating abrasion from trapped material without interfering with existing supports. When accompanied byMartin® DoubleSidedApronSealTMskirtingandclamps, the system forms a tight belt seal, delivering outstanding fugitive material control. When a conventional wear liner loses its edge, the replacement procedure is what operators consistently describe as an undesirable maintenance assignment. Moreover, the Occupational Safety & Health Administration (OSHA) considers most transfer chutes to be ‘permit-requiring confined spaces’, mandating that an ‘authorized entrant’ perform the work inside the chute. An attendant must also stand outside monitoring the safety of the person inside, while assisting in the removal of material from the chute. In some cases, a supervisor further oversees this procedure. The authorized entrant would go into the chute with a grinder to remove the welds and take off the sacrificial liner, which may have required a torch to cut away the existing material. This can be extremely dangerous, for two reasons. First, the liner can weigh several hundred pounds, and when a worker cuts it loose, it can fall and endanger the personnel inside the confined space of the chute. Second, nearly any dust can be explosive under the right conditions, and having to grind or torch-cut the old liner introduces a spark or open flame. An external liner can be installed and adjusted faster and easier, without the need for a grinder or torch, through the use of special mounting tabs. Clips for bolting the liner are initially welded in place, but do not require removal when the liner wears out. Since the work is done from the outside, without any grinding sparks or torch flame, the hazard of explosive dust from tool usage is greatly reduced. Replacement liners come in a standard length of 72 inches (1,829mm), and Martin Engineering uses laser cutting technology to create the complex geometries necessary for a custom fit. The new liner is easily retrofitted onto existing equipment using the EVO® External Wear Liner Retrofit Kit. Installers simply cut back the chute wall on existing chute boxes to accommodate the external wear liner. On new installations, the chute is easily engineered to work with the new liner design, as well as other Martin Engineering components such as dust curtains, track- mounted idlers and cradles. En-masse drag chain conveying technology offers advantages over some other conveying types for coal handling due to the effective utilization of space, totally enclosed housing, and the ability to operate effectively horizontally or vertically. Coal suppliers understand the importance of effectively moving material off ship and rail to distribution and in-plant processing. The en-masse conveying technology is designed to handle high volumes of aggressive materials, such as coal, in a relatively small footprint due to the effective utilization of space. The figure (right) represents the use of conveying space in common conveyor types. The en-masse drag chain conveyor has the capability to move in excess of 1,000tph (tonnes per hour) in a single conveyor with a much smaller drive and overall footprint compared to other conveyor types because the drag chain is moving material using the en-masse principle, harnessing 90% of available conveying space. provides even draw-down of the vessel which means better hourly unloading averages than larger single stationary units. For the last 45 years, CDM Systems has provided high-quality en-masse conveyors and conveying systems that set the industry benchmark for quality, dependability, and operational efficiency. The company uses its material handling experience and industry knowledge to solve the most difficult bulk transportation challenges. Its conveying systems are specifically designed for reliable 24/7 operation in aggressive and high-temperature applications.Whether unloading trucks, railcars, or vessels, or moving commodities within a process facility, CDM Systems can provide the technical support and the right equipment designed specifically for its customers’ needs. Italian company ITALGRU S.r.l. started operations in 1954 and, since that time, has become a major manufacturer of equipment for the cargo handling industry. The company’s equipment can be used to handle a wide variety of commodities, including coal. In the last 20 years, ITALGRU has become a specialist in the construction of mobile harbour cranes for ports, off-shore cranes for oil rigs, FPSOs (floating production storage and offloading units) and FSOs (floating, storage and offloading units), cranes for shipyards, special cranes for the steel sector and other industries that require high lifting capacities and special design features. ITALGRU manufactures mobile harbour cranes equipped with electro-hydraulic or mechanical grabs. refurbishment and upgrading of existing cranes. The ITALGRU mobile harbour crane range starts with the IMHC320 with a maximum capacity of 25 tonnes and extends to the IMHC3160 with a maximum capacity of 160 tonnes. Capacities go up to 1,500tph (tonnes per hour), using mechanical or electro-hydraulic grabs. The company’s offshore cranes can be installed on offshore oil or hydrocarbon drilling rigs, cargo vessels, FPSOs, and FSO barges with lifting capacities ranging from a minimum of 2 tonnes to a maximum of 350 tonnes and beyond. Cranes designed for other sectors come equipped with lifting capacities that range from 7 tonnes to 350 tonnes. Dust emissions are kept to a minimum with the use of anti-dust covers on all grabs. In terms of geographical coverage, ITALGRU is able to offer its products to all the major areas in Europe, Africa, the Middle East and South East Asia. The company’s major customers are port authorities and stevedoring companies, as well as logistics companies as port operators. Most ITALGRU cranes are delivered fully assembled. ITALGRU’s cranes are very high quality, and available at economical prices. This, combined with excellent after-sales service — carried out by supporting companies for scheduled maintenance — enables the company to remain highly competitive in the market. Den Bakker Dustcrusting technology b.v., (DBD Global), has a long history in dust control and prevention. The company originally started in 1948 and has now expanded into several companies, each with a different type of specialization. 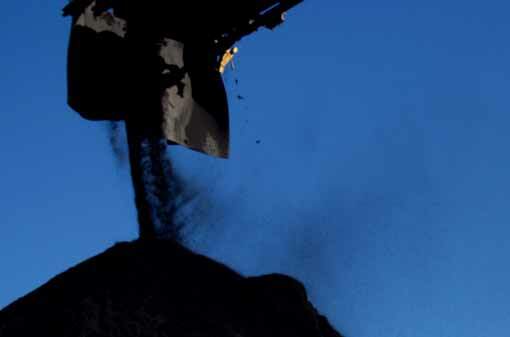 DBD’s solutions are widely used in the coal handling industry to keep dust emissions to an absolute minimum, protecting personnel and the environment. Dry bulk terminals, power plants and emergency services are the major clients at the moment. DBD Global specializes in the control of dust, not only by cleaning areas that are already dusty, but also — and most importantly — working to ensure that dust in any form, does not become a problem in the first place. Ever-more-stringent environmental legislation regarding dust control is creating difficulties for many companies. Being heavily involved in this matter as a contractor for some 30 years, the company has developed a range of solutions to help with dust control, including a range of specially designed water spraying vehicles each having particular capacities and performances to suit the needs of a specific site or condition. The constant desire to improve led to the development of a very effective method to control dust on most of the sites where it is needed:theDustcruster® technology. Although there is not a product that has the same equation, at the moment the products that are the most comparable with Dustcruster liquid® or Dustcruster dry® are the chemical products such as latex. DBD Global has a lot of clients that used the polymer products before they discovered the many advantages of the Dustcruster® technology and started using only the Dustcruster® technology. The big differences and advantages in comparison with the polymer products are; the long endurance of the product, the price that is more attractive and the fact that it is environmentally friendly. Dustcruster liquid® is an inexpensive and environmentally friendly (natural) product. After spraying onto coal and iron ore stacks, it forms a real ‘crust’. Rain barely affects its effectiveness. Only after digging into stockpiles is it necessary to repair the crust by spraying on a new layer at the disrupted area. Dustcruster liquid® has also proven to be a very effective means to settle large sand areas around infrastructural projects and has successfully been used to prevent the escape of dangerous fumes during soil cleaning operations. because of its longer setting time. Dustcruster liquid® can be transported to most locations all over Europe where it is then transferred into large containers, equipped with stirrers and sometimes even with heaters to allow work at near zero conditions. The company sells and rents the containers. For the spraying of Dustcruster liquid® the specific spraying trucks are required, mostly agri-tractor towed. In order to reduce transport charges and to allow the use of the technology on a world scale, DBD Global has created Dustcruster dry®. Dustcruster dry® is a mixture of different fibres which are crushed into pellets and are transported in FIBCs or containers. On location, the Dustcruster dry® pellets are dropped in a special mixing tank with clean water where they transform into a liquid suspension, Dustcruster liquid®, ready for use. Here also, the special spraying trucks are required to successfully cover the coal/iron ore stock piles creating a tough and long- lasting crust. Den Bakker Dustcrusting has created a system where only a small amount of water is needed to create a large amount of foam. Dust control when handling/crushing wood and stone is particularly problematic, as using water can cause humidity problems. This larger foam surface is an excellent dust collector, and results in a better dust-free working environment. In consultation with a client DBD Global is developing an automatic spraying system for Dustcruster liquid® to apply on a coal wagon loader. The installation could be interesting for more coal terminals. This spring the installation will be ready; Dry Cargo International looks forward to reporting on this project in greater detail in the near future. Den Bakker Dustcrusting technology has gained vast experience internationally in the control of outdoor dust and uses very advanced systems, stationary as well as mobile, with natural fibre and/or with polymers or other products, and which can operate under the most severe conditions, such as frost and strong wind. “Handling coal presents numerous challenges requiring both complex and equipment-intensive processes that involve a number of operations from offloading trains, to coal storage, to in-plant and overland conveyor systems,” says DemcoTECH Engineering General Manager, Paul van de Vyver. “For an operation to be profitable, the entire coal handling system needs to be optimized and reliable, minimizing handling problems and plant downtime that are related to material flow throughout the entire system,” adds van de Vyver. “In addition to having access to the latest technologies, advanced testing, flow modelling and system simulation tools are also critical in designing efficient handling systems. The design of these systems must be based upon a thorough understanding of the properties of the coal, particularly for the worst flow conditions that are expected to occur in practice with wet coal. Critical elements include determining the bin, stockpile, feeder or chute geometry, predicting accurate material flow patterns, ensuring that reclaim systems are reliable and predictable, and thorough design analysis and detailing of the entire plant. “Much of our success has therefore been due to the fact that our materials handling design expertise, together with our finite element analysis skills for large stockyard and port machines, are supported by our in-house design capabilities and experience working with international standards such as ISO, FEM and CEMA,” says van de Vyver. DemcoTECH has an extensive track record in the supply of effective dust suppression and dust extraction systems, as well as in utilizing its in- house pipe conveyor design capabilities to contain, reduce and eliminate dust and environmental issues when conveying materials. Despite the ongoing slow market conditions characterizing the coal sector worldwide, Johannesburg-based DemcoTECH Engineering continues to see the award of new projects from various coal industry players, such as power plant and port operators. evaluation of the train wagon tippler system. The work included both the concept and basic design of the system, including the development of a simulation model with the railroad engineers. At the end of 2014, DemcoTECH was appointed to provide the detailed design for an import terminal at a Croatia Port. including the train rapid rail load-out system. The system will initially offload 2,000tph (tonnes per hour) of both coal and iron ore from Capesize ships and is due to be operational towards the end of 2016. “The system is, however, designed for future expansion up to 4,000tph,” adds van de Vyver. The ships will be offloaded using grab type ship-unloaders and the stockpiling and reclamation will be performed using a rail- mounted bucketwheel stacker-reclaimer. In addition, DemcoTECH is responsible for the design of the standby stockpile facility. This will utilize mobile plant feeding into mobile hoppers, which discharge onto the yard conveyor using dual vibratory feeders. The mobile hoppers can be positioned along the entire length of the new yard conveyor. continent with the Adriatic sea. The reconstruction of this Dalmatian port was announced in 2006 to enable the largest seagoing vessels to be able to enter the harbour. Previous coal handling projects include the appointment of DemcoTECH by Grindrod as EPCM contractor responsible for design, engineering, procurement and construction management for the materials handling portion of the expansion to Grindrod’s multi product terminal at the port of Richards Bay in South Africa. The scope of the contract was to provide the materials handling system conveying various materials, but mainly coal and rock phosphate from the three Richards Bay terminal sites: Navitrade, Kusasa and Valley. The plant includes a tippler discharge onto three belt conveyors, one of which feeds an open stockpile or the DemcoTECH designed and supplied pipe conveyor. The pipe conveyor feeds to a transfer point at which the material is distributed to the existing export line or to a warehouse. The 2,000tph materials handling system at the Valley terminal site was an extension to plant supplied by DemcoTECH some three years previously to convey material from terminal conveyors to feed a single warehouse. The expansion extended the lead conveyor to feed a choice of two other warehouses. “As this was a brownfields site, the interfacing of new equipment into the existing equipment had to be carried out around planned shutdowns in order to minimize disruptions to operations,” concludes van de Vyver. DemcoTECH Engineering is a specialist bulk materials handling and niche process plant company, offering services from concept design through to project completion to the power generation, cement, mining, metallurgical, manufacturing and port handling industries. Services include conceptual design, feasibility studies, design, engineering, procurement, expediting, construction and commissioning. Plant supplied by DemcoTECH includes troughed conveyors, air- supported conveyors, pipe conveyors, rail-mounted slewing boom stackers, pivot boom conveyors and mobile conveyors. After-sales services include spares, maintenance, refurbishments and operational readiness packages covering procedures, systems and workplace tools required to successfully operate and maintain a new or upgraded plant.